While most eyes have been on developer Delancey’s plans for the redevelopment of the Elephant and Castle shopping centre, on the other side of Southwark an equally large proposal to build over a thousand homes without any social rented housing has been stealthily making its way towards planning permission. Grosvesnor Estates bought the Biscuit Factory site in Bermondsey in 2013. The total site combines the former homes of biscuit manufacturer Peek Freans and the former Bermondsey campus of Lewisham and Southwark FE College. Peek Freans closed in 1989, the college left in 2013 and the site is currently occupied by a variety of businesses and offices. Grosvenor proposes a £500m mixed-use development of 1343 new homes with 21000 sqm of other uses, and a new school. The homes will all be Build to Rent (BtR), owned and managed by Grosvenor; none of the homes will be for sale. Grosvesnor are offering 27.5% ‘affordable’ housing at an average of 75% market rents, near the allowed maximum of 80%. No social rented housing or ‘social rent equivalent’ affordable housing is proposed. Grosvenor offer to be ‘flexible’ about the range of affordable rents, but insist that the average of 75% must be maintained, so any gains at the bottom end would force rents at top end, beyond even 75%, or further reduce the overall quantum of affordable housing. Southwark Council’s adopted housing policy does not support BtR. The housing policy for this part of Bermondsey requires 35% affordable housing, 70% of which should be social rent. This would amount to around 470 affordable units in total, 330 of which should be social rent. Policy also requires that the remainder of the affordable housing be shared ownership. By contrast, the affordable housing in Build to Rent is a form of affordable rent, at up to 80% market rent. Since 2011 Southwark have maintained that affordable rent does not meet the borough’s housing needs, but it is now in the middle of a sharp policy u-turn, which proposes allowing affordable rent (called Discounted Market Rent) in the latest version of the local plan, the New Southwark Plan (NSP) (see policy P4). Grosvenor are taking advantage of the situation (and employing the same tactic as Delancey) by relying on this so-called ‘emerging’ policy, rather than the policy as it stands, to get their BtR application through planning committee. The London Plan, Sadiq Kahn’s draft housing strategy 2016 and the government’s White Paper also provide encouragement to impatient BtR developers. Even if ‘emerging’ policy were applied to allow a BtR development, Grosvenor’s affordable housing offer still comprehensively fails to fulfill its demands. The NSP Policy P4 for BtR requires 35% total affordable housing, made up of 12% ‘social rent equivalent’, 18% London Living Rent, and 5% for £60k-£90k incomes. Grosvenor falls short on every measure - 0% social rent equivalent, 0% London Living Rent, 100% at £60k-£90k market rent, and only 27.5% affordable housing in total. Other areas where Grosvenor’s scheme fails policy tests are the number of studio flats - (146; there should be no more than about 70 (5%), according to Southwark’s Core Strategy) and the length of covenant keeping the BtR units as rented tenure (a 15 year covenant is offered, emerging policy requires thirty years). Management and lettings of affordable housing also appears to be a problem. Grosvenor makes no mention of using a registered provider and is evidently reluctant to extend tenant nominations to Southwark. Grosvenor stresses that while ‘it will work with LBS to enable prospective tenants to be sourced from any such list’ (ie Southwark’s proposed intermediate housing list)…The lettings and nominations arrangements will need to recognise that Grosvenor will need ultimate control over the occupation and management of the Proposed Development’. As always the lack of affordable housing is justified by viability and it is no surprise to see that the viability assessment has been drafted by DS2, who did the same job for Delancey’s shopping centre development. In keeping with Southwark’s development viability policy we won’t get to see the full assessment until a week before it goes to planning committee, and have to rely on an executive summary for any idea of the scheme’s finances. The executive summary is deficient, policy-wise, in several respects; the construction, acquisition and other development costs and professional fees are lumped into one figure, instead of given seperately. Instead of developer profit (on cost) Grosvenor has submitted an ‘Internal Rate of Return’, which is given as an obscure percentage (7%), not as a readlily understandable cash figure. Despite the obscurity, we have run our own calculation of profit (on cost), by subtracting the total costs listed from the gross development value, which gives a figure of £99m. 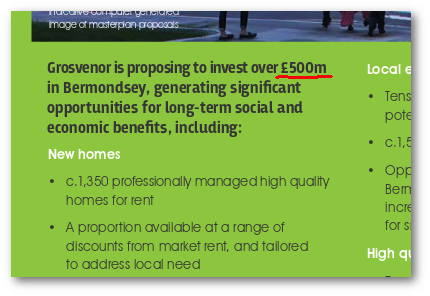 This is not enough for Grosvenor, who reckon a ‘reasonable return’ is 12% IRR and they‘therefore cannot afford to deliver any affordable housing’. Grosvenor also claim that there can be no affordable housing because of a list of other benefits the scheme provides, including ‘the delivery of a new school’, despite Section 13 of its Planning Statement acknowledging that ‘the construction of the new school is anticipated to be funded by the ESFA (Education and Skills Funding Agency)’. All is not lost though, because Grosvenor generously propose that ‘notwithstanding the overall scheme viability, it would be willing to offer 27.5% affordable housing, delivered as discount market rented (“DMR”) homes (“Grosvenor’s Offer”).’ The average discount would be 25% ie 75% market rents, close to the maximum of 80% allowed for ‘affordable rent’. Exactly how much this will be we are left to guess - unlike Delancey’s proposals for the shopping centre Grosvenor does not provide any rent tables for either the market or affordable housing. Current new-build market rents in the SE16 postcode are upwards of £1500pcm. The Grosvenor Estate ‘represents all the business activities of the Grosvenor Family, headed by the Duke of Westminster’. One of its three arms is Grosvenor Group which ‘represents the majority of the Grosvenor Estate’s urban property activities and is its largest business’. This in turn includes Grosvenor Americas, Grosvenor Asia Pacific and Grosvenor Britain & Ireland, which has £5.1bn of assets and is the applicant for the Biscuit Factory. The Biscuit Factory is also the number one development listed in the Grosvenor Britain & Ireland’s summary of developments. Thanks to a secretive network of offshore firms, the Duke of Westminster is reputed to be worth £9bn and is the world’s richest man under 30. The Biscuit Factory on the other hand, is on the doorstep of South Bermondsey and Rotherhithe, two of six Southwark wards with neighbourhoods classified as being in the bottom 10% most deprived in the country, so the need for social rented housing hardly needs demonstrating. Grosvenor’s spin on the Biscuit Factory that it will bring life to a ‘burgeoning new neighbourhood in London’, artfully propogated by the usual community engagement soft-soap, but if Grosvenor had any genuine interest in the community it would simply build the affordable housing that local planning policy requires and build social rented housing; the demands are not onerous. As it is, one of the very richest families in the country will be getting richer at the expense of people in one of its poorest areas, by depriving them of the homes they need. This is not a planning application that deserves approval, by any measure. 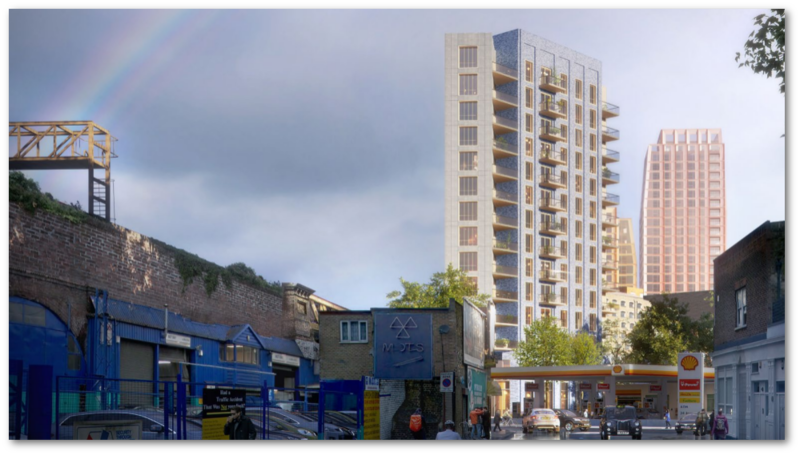 Southwark’s planning committee came close to throwing out Delancey’s shopping centre application; it should make no mistake this time and send Grosvenor and its dreadful planning application packing. You can help by objecting to the application, by following this link.